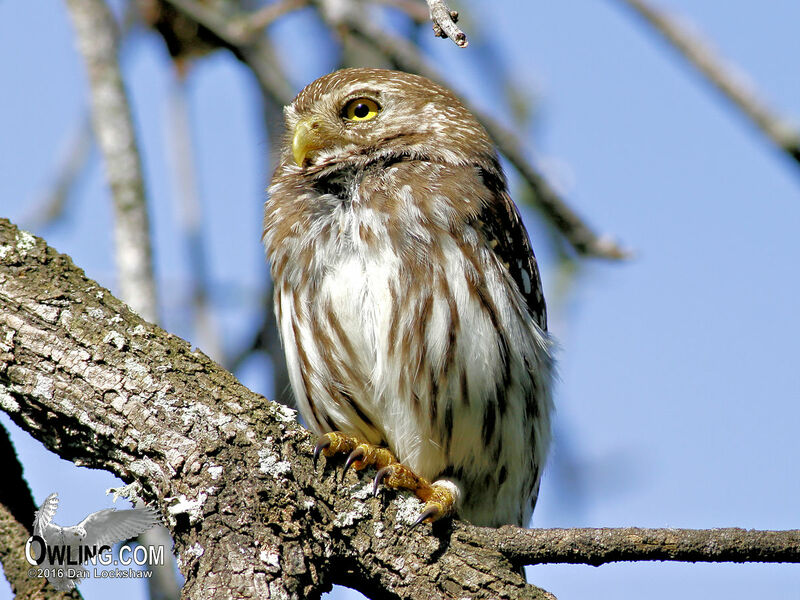 Subspecies: There are 2 races of Ferruginous Pygmy-Owl here in the US. One to four other owls may be considered additional races in Central America but further research needs to be done for these classifications to be agreed upon. 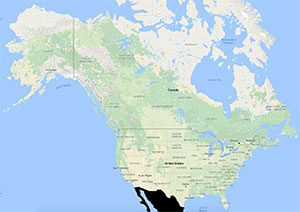 G. b. cactorumis is found from S Arizona south along the West Coast of Mexico. 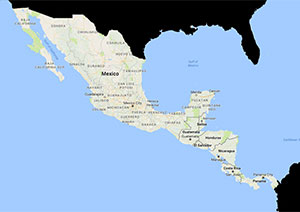 G. b. ridgwayi is found from Southern Texas E and S Mexico to Panama. Wingspan: 14.5 – 16 in. Length: 6.5 – 7 in. Tail: 2 – 2.75 in. Average Weight: Male: 2.2 oz. Average Weight: Female: 2.7 oz. Description: A small owl lacking ear tufts. Male and female are similar in plumage. The eyebrows and lores are white and are bolder than the other white markings. Chest is white with rufous-brown streaks; iris of the eyes are lemon yellow; bill is yellow to greenish or grayish-yellow. 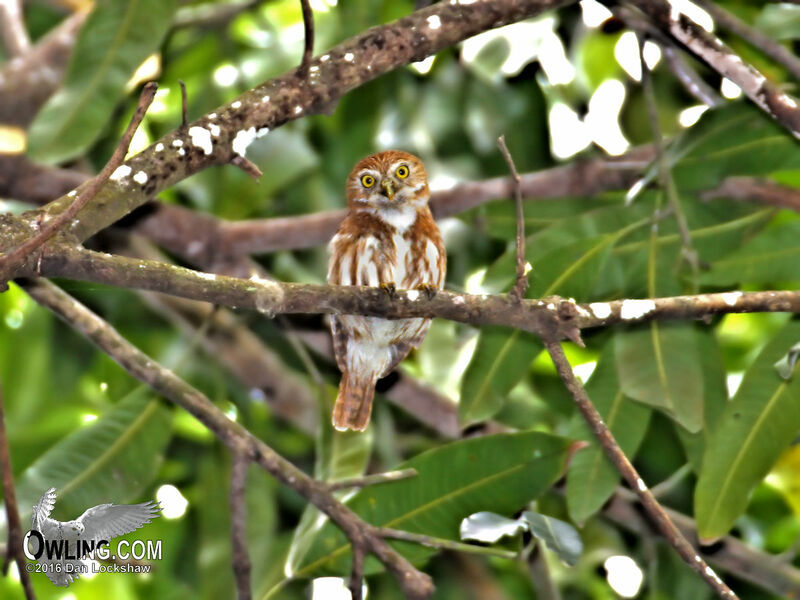 The Ferruginous Pygmy-Owl is very similar to the Northern Pygmy-Owl with the distinctions of habitat, call, color, white crown streaking and usually tail band color. As the name implies (ferruginous is defined as reddish-brown or rust in color), a major distinctive field mark of this owl is the rufous or reddish-brown tail bars (the Northern Pygmy-Owl having white barring) and over all color (Note: there is a grayish phase in Mexico that is gray with white tail bars and a rarer red phase with no tail bars). The Ferruginous Pygmy also has white streaking on the forehead and head, where the Northern Pygmy’s markings are more rounded spots. The backside of both Pygmy-Owls have similar white markings, but the over all color is more reddish-brown for the Ferrug (Texas birds are more gray-brown). 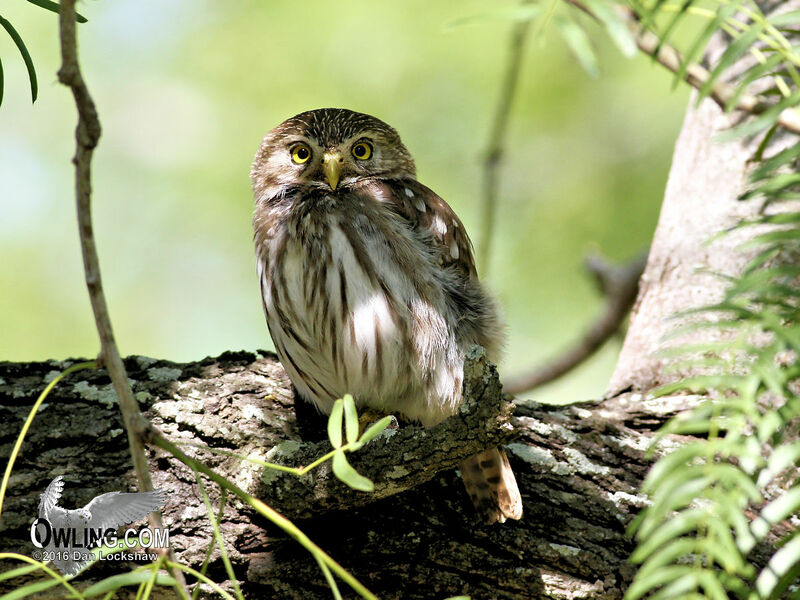 The, so called, “false eyes” of the Pygmy-Owls are a distinctive pair of black patches bordered with white on the nape. The only actual overlap of range, between the two Pygmy-Owls, is in a very small area of Southern Arizona so the possibility of mistaking their identification is slight. 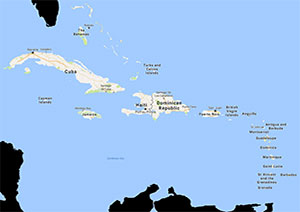 In addition to this, the Ferrug is a lowland bird and the Northern Pygmy is a mountain bird (some overlap “might” occur only in winter when the Northern Pygmy may move down slope). 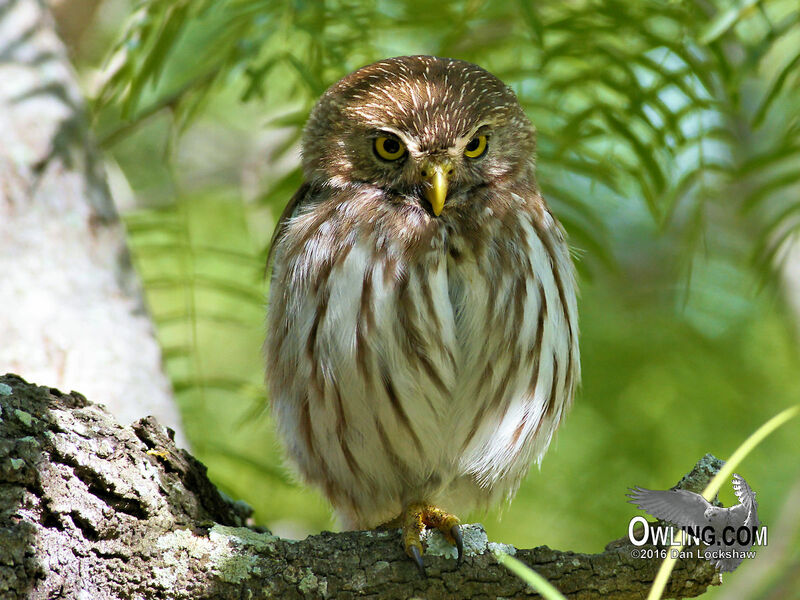 The different calls of the Pygmy Owls may be the single best method of field separation. The male Ferruginous Pygmy’s advertising call is described as a whistled “popping” sound and has a shorter interval between the notes than there is in the Northern Pygmy’s. The female Ferrug, if present, may also respond to the male with a rapid “chitter”. Young: Although the white streaking on the forehead and head is not developed on the juvenile Ferruginous, the rust tail bars are, making identification possible. The young also have a high-pitched rattle begging call. In Arizona the Ferrug occurs in saguaro desert, mesquite, and cottonwood-mesquite habitats. In Texas it is now mostly confined to remaining patches of mesquite, ebony, and cane along the lower Rio Grande (may also be found in live oak forests of Kenedy and Willacy counties). In general, the Ferruginous Pygmy is a lowland bird found in more arid habitats than the Northern Pygmy-Owl. The Ferruginous Pygmy-Owl is a diurnal and crepuscular owl feeding mostly on insects, such as grasshoppers, crickets, caterpillars, other large insects and scorpions. In addition, their diet consists of birds, small mammals, amphibians, and reptiles (often lizards). Like the Northern Pygmy-Owl, the Ferruginous Pygmy-Owl is a bold and ferocious daytime predator, sometimes attacking prey larger than itself, such as American Robins or young domestic fowl. There are even records of attacks on captive Guan, the owl grabbing on firmly to the Guan and tearing at it, eventually wearing it out and killing it. Like other Pygmy-Owls, the Ferrug are cavity nesters. They nest in a natural cavity in a tree, stump or snag, in old woodpecker holes, tree forks or depressions, occasionally in a sand bank or termite mound. The breeding season for this species may begin as soon as early April and last as late as mid-June. Clutch size is usually 3 or 4 eggs but 2 to 5 are not uncommon. Incubation and brooding is done by the female and the eggs hatch at approximately 28 days. The male brings food to the female during incubation and brooding. Both adults will bring food to the young at 3 weeks after the young hatch. Intense brood competition over prey may result in fatalities of the young. Fledging occurs at about 28 days after eggs hatch. Adults will care for the young for an additional 3 weeks following fledging. The Ferruginous Pygmy-Owl is endangered in Arizona and facing loss of habitat in both Texas and Arizona. Although it is endangered in North America (Arizona), it is still quite frequent over much of its Mexican range. The owl is generally sedentary although its range expands after the fledging of the young.